The Cardinal A team finished all alone in 3rd place, 8 strokes behind Oregon and 7 behind USC, in the US Intercollegiate played at Stanford. The Cardinal B team finished an impressive 6th overall ahead of the 13th ranked San Diego State team demonstrating the excellent depth that exists at the Farm this season. 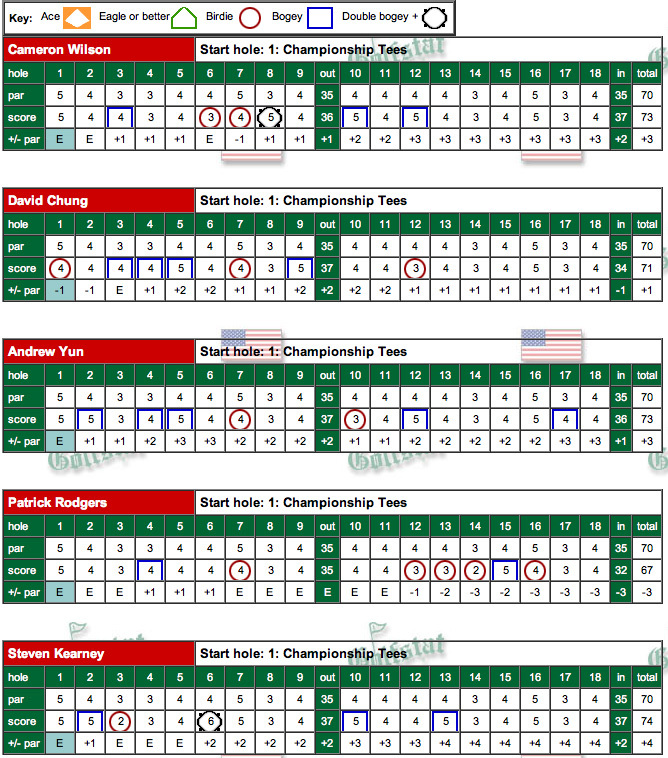 Patrick Rodgers led the way for Team A as he tied for 5th at even par (68-67-75 210), followed by Andrew Yun who tied for 10th after a strong final round 68 (71-73-68 212) while David Chung also finished strong with a 69 to tie for 14th (74-71-69 214). Cameron Wilson tied for 19th (71-73-72 216) and Steven Kearney tied for 61st (80-74-72 226) as he steadily improved his play each round. 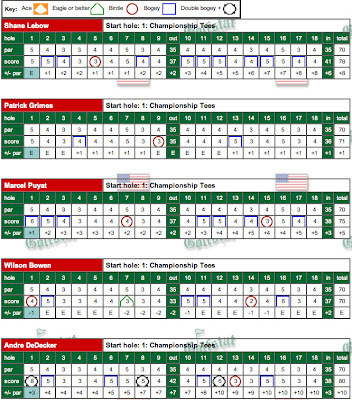 Stanford's Team B was led by two freshmen as Patrick Grimes tied for 17th with a 215 total (72-71-71), Marcel Puyat tied for 19th (72-69-75 216), Wilson Bowen tied for 25th with a strong final round 70 (71-76-70 217), Shane Lebow tied for 53rd (69-77-78) and Andre De Decker tied for 81st (75-79-80 234). Next up for the Cardinal is the Western Intercollegiate played at historic Pasatiempo in Santa Cruz, CA, about 40 miles south of the Stanford campus. 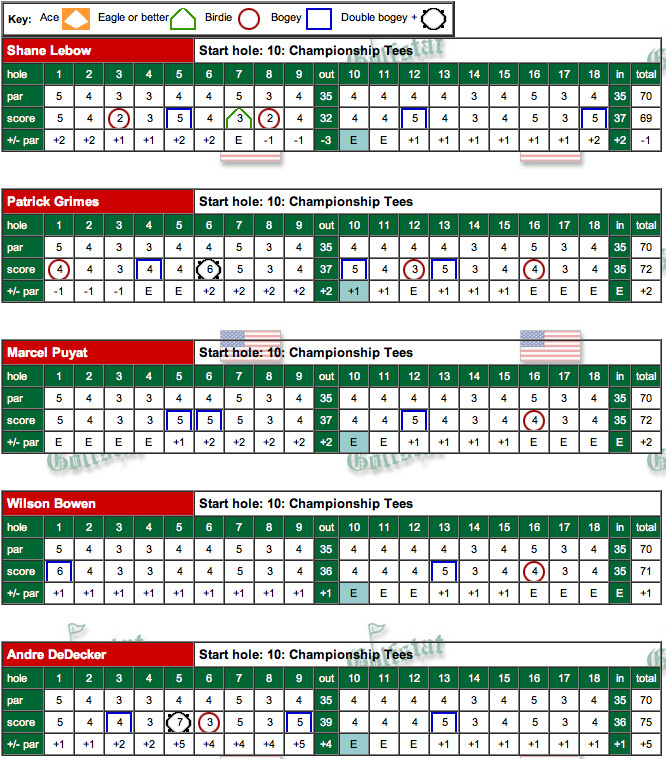 Final round scorecards are included below. It was a wild day on the Farm in a second round played in cool, very windy and rainy weather leading to a 2 hour rain delay from 11 am to 1 pm. Despite the weather, both Cardinal teams played well as Team A ended tied for 3rd and Team B is impressively tied for 5th. 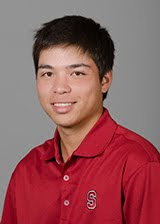 The Cardinal Team A tied for the day's best round at 4-over 284 total led by a remarkable 3-under 67 from freshman Patrick Rodgers who now leads the individual results (68-67 135) by two shots over Oregon's Eugene Wong. Team B is led by two freshmen as Marcel Puyat fired a brilliant 69 and he's tied for 8th individually (72-69 141) while Patrick Grimes is tied for 18th on rounds of 72-72 with Cameron Wilson (71-73) and Andrew Yun (71-73). 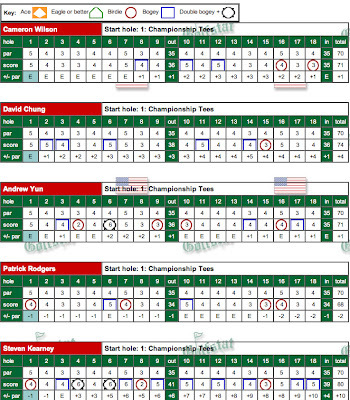 Stanford finds itself still 12 strokes behind the impressive Oregon team whose top 3 players are Wong in 2nd and two others tied for 3rd individually. USC is in 2nd place 4 shots ahead of Stanford while UCLA is tied with Stanford for 3rd place. The two Stanford teams entered both shot 4-over par 284 totals to finish tied for 6th, 12 shots behind the leader Oregon. 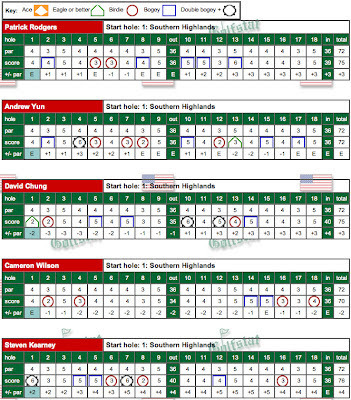 The Red team was led by Patrick Rodgers who fired a 2-under par 68, followed by Cameron Wilson and Andrew Yun with 71, David Chung with 74 and Steven Kearney with 80. Article by San Jose Mercury News after round 1. 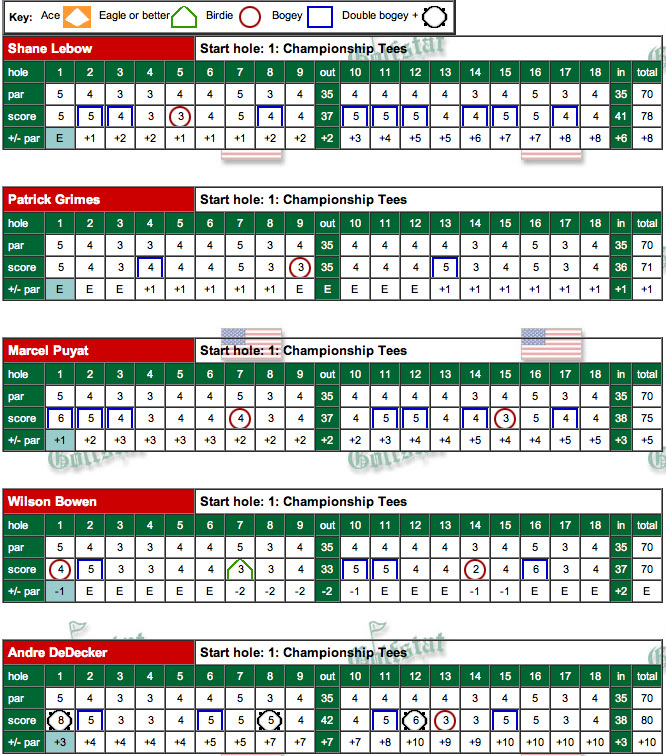 Scorecards are shown below - click to enlarge. 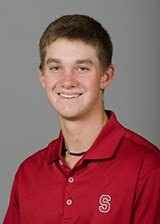 STANFORD, Calif. - The Stanford men's golf team hopes this weekend's U.S. Intercollegiate on its home course will provide a big dose of momentum heading into championship season, which begins with the Pac-12 Championships in late April. Three squads currently ranked in Golfweek's/Sagarin top-10 headline the 16-team U.S. Intercollegiate field, including No. 4 UCLA, No. 5 USC and No. 7 Washington. Stanford and Oregon are ranked 11th and 12th, respectively, in the latest Golfweek/Sagarin ratings while San Diego State is ranked 13th. Colorado, Fresno State, Nevada, Oregon State, Pepperdine, San Francisco, San Jose State, UC Davis, Utah and Washington State round out the field. Teams will play 18 holes over three days beginning on Friday at Stanford Golf Course (par-70; 6,727 yards), teeing off on holes No. 1 and 10 at 8:00 a.m. each day. Stanford will enter two squads in this event. The "red" team will consist of (in order) Cameron Wilson, David Chung, Andrew Yun, Patrick Rodgers and Steven Kearney, while the black team will be made up of Shane Lebow, Patrick Grimes, Marcel Puyat, Wilson Bowen and Andre DeDecker. Rodgers, ranked fifth in Golfweek's most recent individual rankings, is the highest-rated player in the field, followed by Chris Williams of Washington and Eugene Wong of Oregon, who are ranked No. 6 and 9 respectively. San Diego State has two players ranked in Golfweek's top 20 in Todd Baek (12th) and J.J. Spaun (15th), while USC's Steve Lim is ranked 18th. The Cardinal opened the spring with a solid third place showing at the Amer Ari Invitational on the Big Island before finishing ninth at the San Diego Intercollegiate Classic and fifth at the Southern Highlands Collegiate Masters. Stanford will participate in the Western intercollegiate at Pasatiempo Golf Club on April 14-15, which will be its final tune up prior to the Pac-12 Championships, slated for April 27-29. The Cardinal will only have to look out its front door this weekend to find a measuring stick of its competition. "This will be a good warm up for the Pac-12 Championships," said Ray. "Our conference is so stacked with UCLA, USC, Washington and Oregon all playing at a high level. We're anxious to see how we compete at this time of year." Even though Stanford's last U.S. Intercollegiate title came in 2007, Ray is hoping course knowledge will play a key role in the Cardinal's fortunes this weekend. "Knowing the course should work in our favor and serve as a good prep for the NCAA Regionals which we will host in May. It's never too early to start building momentum." 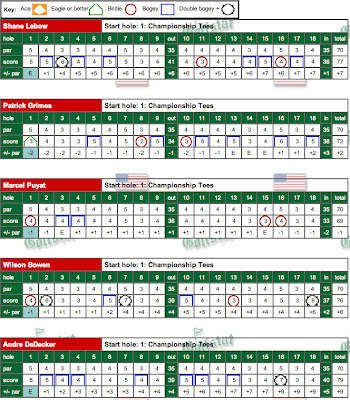 Oregon won the last U.S. Intercollegiate played in 2010 with a score of 839 (-1), while Duck Daniel Miernicki earned medalist honors with a score of 202. The Southern Highlands Collegiate Masters hosted by UNLV brings together 7 of the nation's top 15 teams in an event played on a top notch Robert Trent Jones (Sr. and Jr.) designed golf course, the Southern Highlands golf course. See further background below. Stanford finished 5th sixteen shots behind the winning host UNLV team after a final round 305 total on a day with difficult scoring conditions. Cal finished 2nd, UCLA 3rd and Texas A & M 4th. Stanford finished ahead of top-ranked Texas and 3rd ranked Alabama. 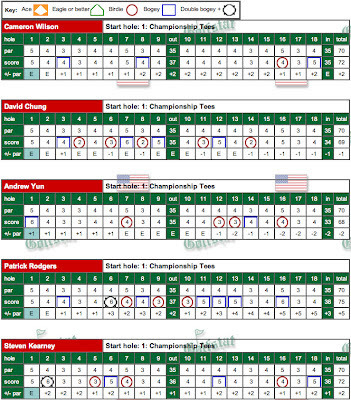 Complete scoring was provided by Golfstat. 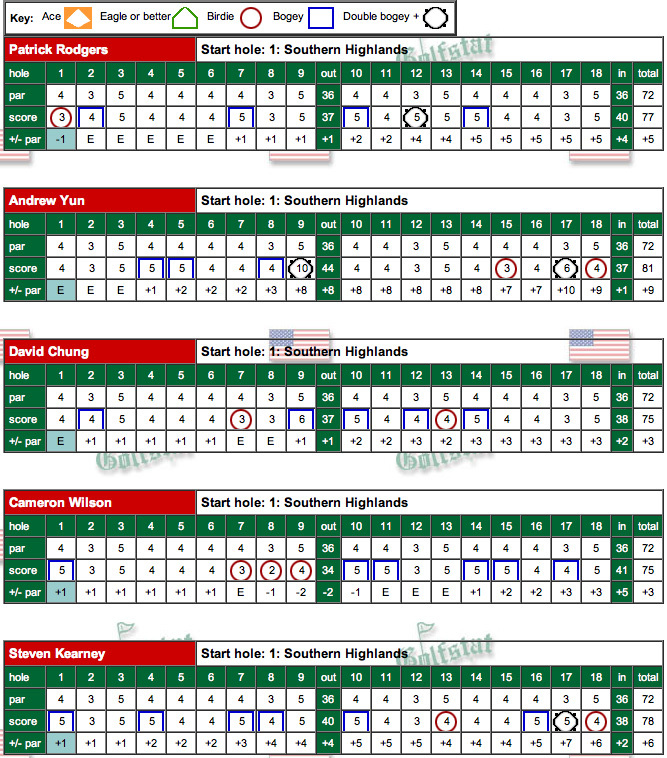 Senior co-captain David Chung led the Cardinal in scoring finishing tied for 15th (75-71-75 221), followed by Patrick Rodgers (75-70-77 222) and Cameron Wilson (70-77-75 222) who tied for 23rd, Andrew Yun (72-75-81 228) who tied for 46th and Steven Kearney (76-75-78 229) finishing 48th. The low round of the final day was a 3-under 69 by Blake Biddle of host UNLV who won the individual title with a 212 total, 2 shots ahead of two players. 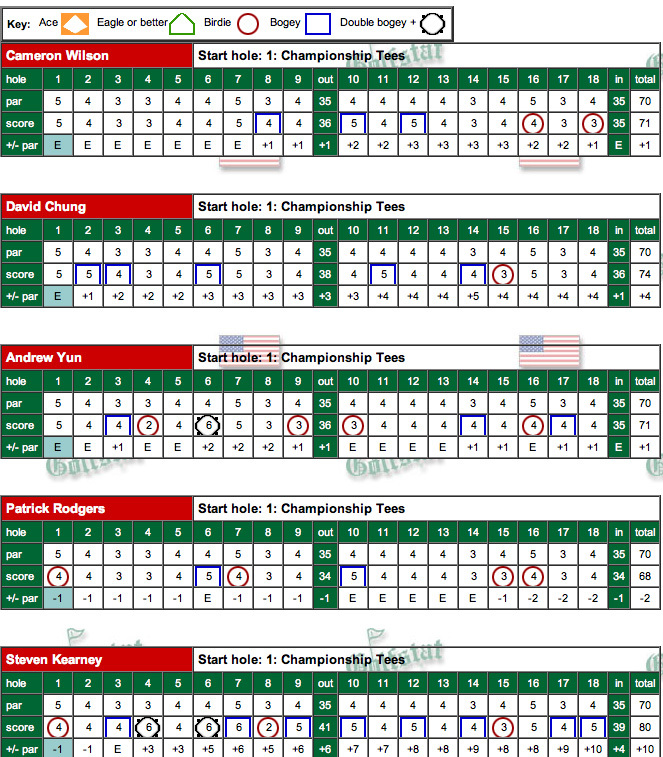 David's steady final round 75 included 2 birdies and 5 bogies while Cameron's 75 started with a scorching 34 front nine followed by a back nine marred by 5 bogies. 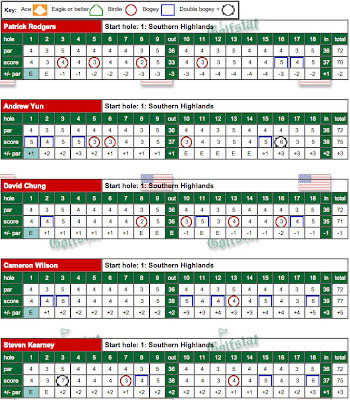 Andrew's final round of 81 was actually very steady except for a disastrous 10 on the par 5 9th hole and a triple bogey 6 on the par 3 17th hole. Next up for the Cardinal will be to host the US Intercollegiate at Stanford March 30 thru April 1st. 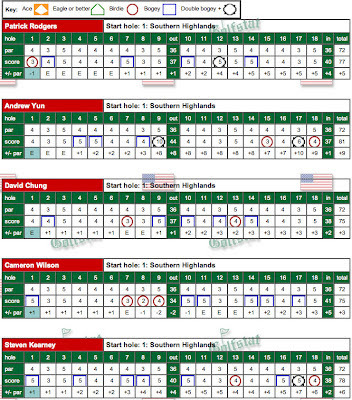 Final round scorecards can be found below -- click to enlarge. Stanford (ranked 12th) finds itself tied for 4th with UCLA (ranked 5th) after two rounds, 10 shots behind the leader Cal (ranked #10) and 1 shot ahead of nationally top ranked Texas. 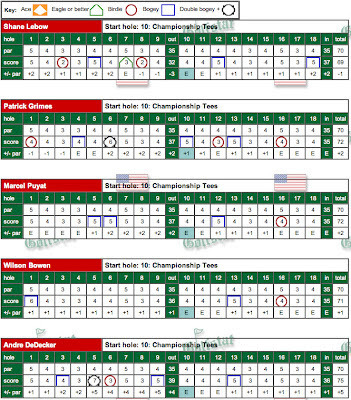 Host UNLV (ranked 11th) is in 2nd 6 shots behind Cal and Texas A & M (ranked 15th) is in 3rd another stroke behind. Third ranked Alabama is 4 strokes behind Stanford. 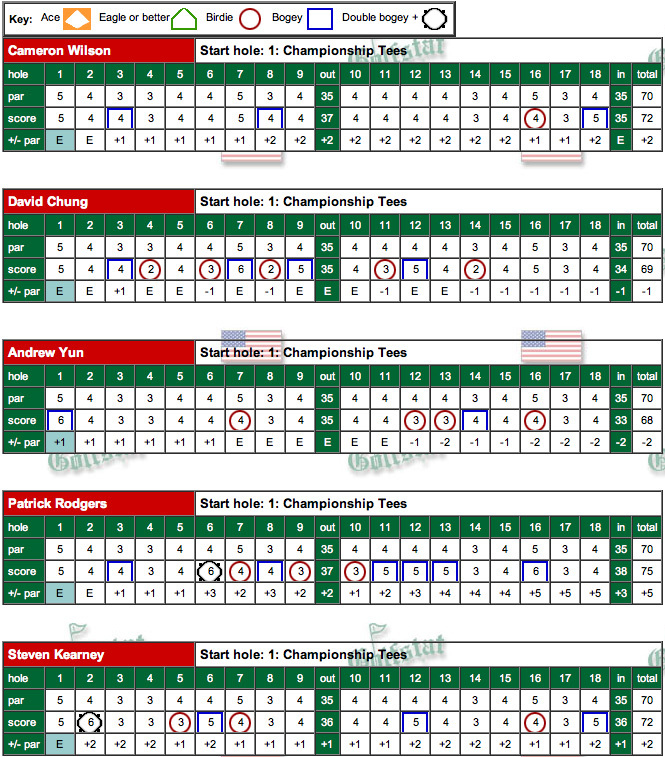 Patrick Rodgers leads the way at 1 over 145 total after rounds of 75-70 ( T17) followed by David Chung (75-71 146 T26), Andrew Yun (72-75 147 T32), Cameron Wilson (70-77 147 T32) and Steven Kearney (76-75 151 T48). 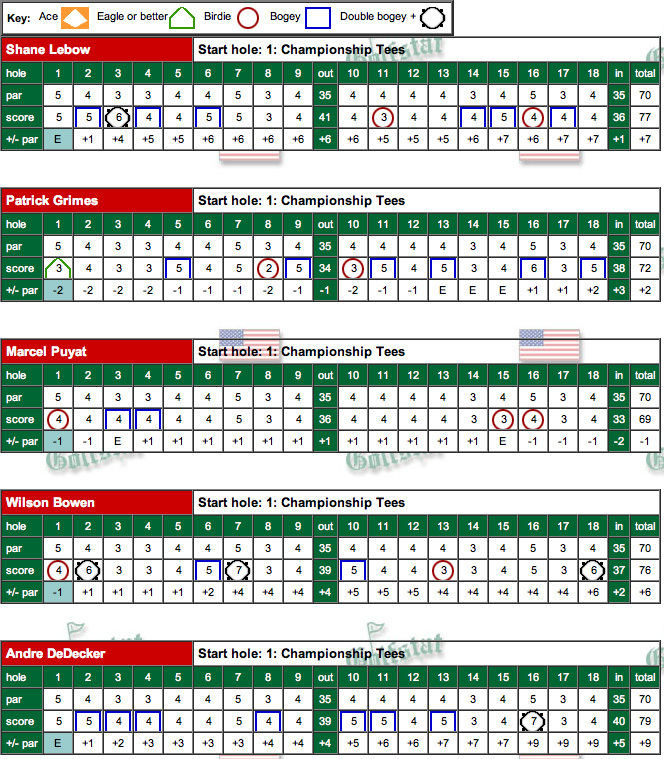 Second round scorecards are shown below. The Cardinal will be paired with Texas and UCLA in the final round. 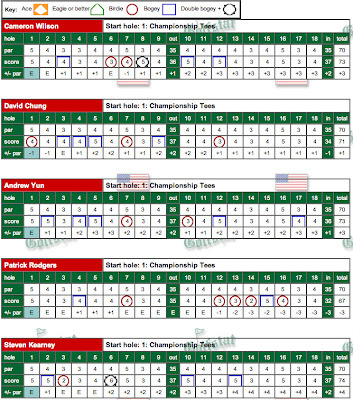 The field is tightly bunched as 12 teams are within 10 shots of the Cardinal. Stanford is tied for 5th place after round 1 in the Southern Highlands Collegiate played in Las Vegas and hosted by UNLV. 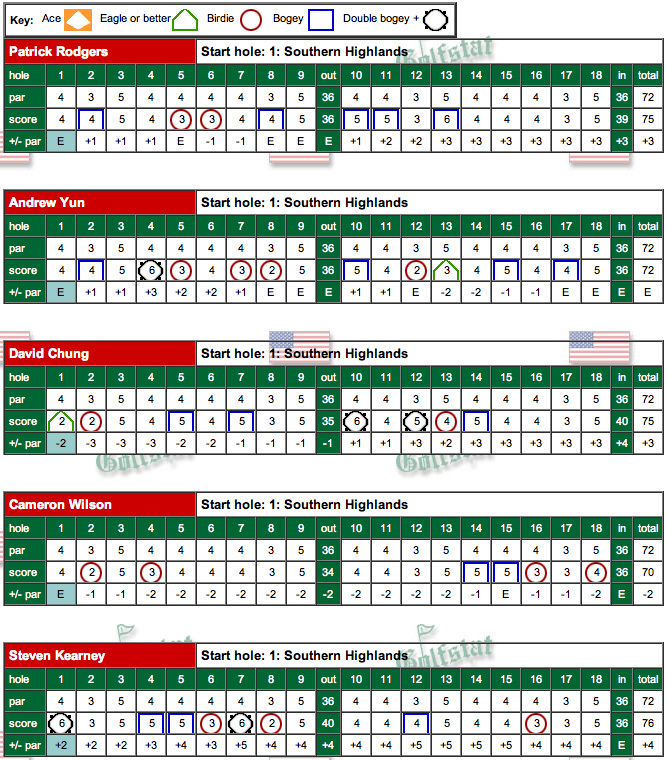 Cameron Wilson led the way with a 2-under 70, followed by Andrew Yun's 72, Patrick Rodgers and David Chung at 75 and Steven Kearney at 76. 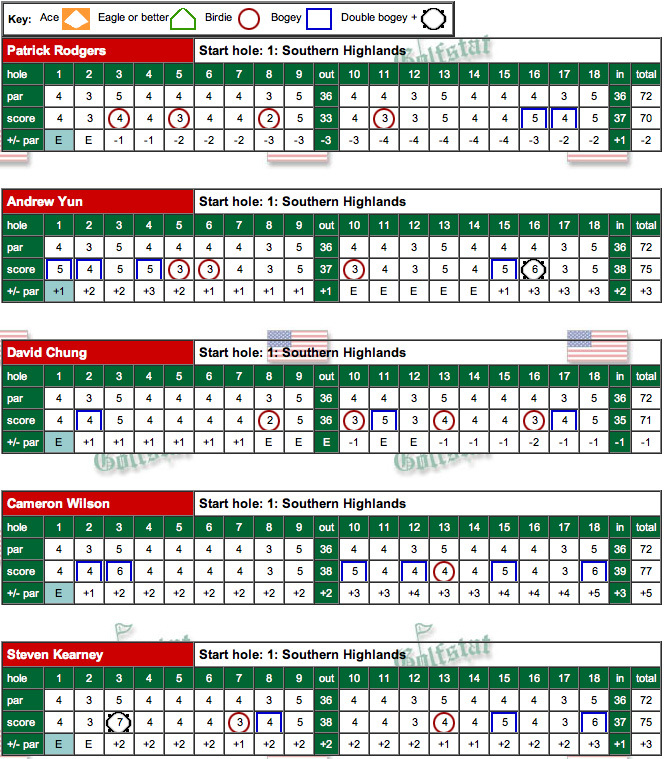 Round 1 scorecards can be found below -- as always click to enlarge. Five of the nation's top 10 schools are competing. The dramatic Southern Highlands golf course was co-designed by the late Robert Trent Jones Sr. and his son Robert Trent Jones, Jr.
STANFORD, Calif. -- - Stanford resumes its spring schedule this weekend at the Southern Highlands Collegiate Masters in Las Vegas, Nev., where five of the top-10 teams in the nation highlight one of the spring's most elite fields. Teams will play 18 holes over three days beginning on Friday at the Southern Highlands Golf Club (par-72; 7,510 yards), teeing off on holes No. 1 and 10 at 8:00 a.m. each day. 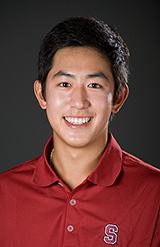 Stanford, currently ranked 12th in Golfweek's/Sagarin rankings, will be joined in the field by No. 1 Texas, No. 3 Alabama, No. 4 USC, No. 5 UCLA, No. 10 California, No. 11 UNLV, No. 15 Texas A&M, along with squads from Arizona State, Duke, Florida, New Mexico State, Oklahoma State, TCU and Texas Tech. Knowles Family Director of Golf Conrad Ray is expected to start a lineup consisting of (in order) Patrick Rodgers, Andrew Yun, David Chung, Cameron Wilson and Steve Kearney. Rodgers has secured five top-10 finishes in six events this season and continues to lead the team in stroke average at 70.8. He is currently ranked No. 5 among the nation's top individuals, according to Golfweek. Jordan Spieth and Dylan Frittelli of Texas, ranked No. 1 and 2 by Golfweek, along with No. 4 Justin Thomas of Alabama and No. 7 Julien Brun of TCU, are also expected to be entered in the field. Oklahoma State won last year's event with a score of 863 (-1), while Cowboy Morgan Hoffman earned medalist honors with a 54-hole score of 206 (-10). The Cardinal is coming off an eighth place finish at the San Diego Intercollegiate, which was held Feb. 12-14 at the San Diego Golf Club in Chula Vista. Following the Southern Highlands Collegiate Masters, Stanford will return to action on March 31, playing host to the U.S. Intercollegiate at Stanford Golf Course.